Action is key. No actions, no results. Success happens when you make a decision and follow through with action. 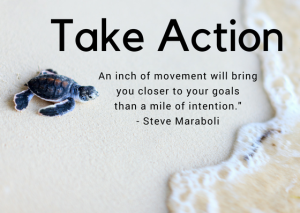 These actions have to be predetermined steps that will move you closer to your goal. There is no shortcuts to living out your dream or being successful. The one and only secret to success is to take persistent steps towards your goal. Taking action will require you to get out of your comfort zone. Do what you have not done before and keep doing it consistently till you get what you want. Whatever it is that you did today promise yourself to double that action tomorrow. Stay fired up and motivated. Reward yourself along the way. As proven by psychology, rewarded behavior is always repeated. An accountability partner is key to helping you stay on the path. Find someone to hold you accountable for your actions weekly. Report to them weekly and you will see your world change. You won’t even recognize the person you were before.